Twenty U.S. states have filed a motion to block funding for a wall President Donald Trump plans to build on the southern border. The states led by California requested that a federal judge stop Mr. Trump from diverting federal funds to build his promised wall along the U.S.-Mexico border. 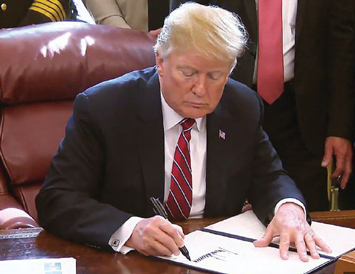 President Donald Trump signs a veto against congressional resolution that rescinds his national emergency declaration at the U.S.-Mexico border, Mar. 15. In the filing, the states argue that Mr. Trump’s declaration of a national emergency in order to divert federal funding to the wall from other sources is against the U.S. Constitution. “Notwithstanding the president’s expressed frustration with Congress and the legislative process, he must act in accordance with the procedures established in the Constitution to obtain funding for his border wall,” the filing reads. The states also say that construction of the wall could cause “possible irreparable harm to endangered species” living near the border, adding the Trump administration has violated the National Environmental Policy Act as it had failed to study the potential environmental impact of the wall. “This wall is unnecessary, and an abuse of power that will take away resources that could be used to help Americans across our nation,” New York Attorney General Letitia James said on Twitter. After Congress rejected Mr. Trump’s request for $5.7 billion to build the wall, the Republican president declared a national emergency to fund the barrier using Pentagon funds. Under the emergency, Mr. Trump would appropriate a total of $8 billion previously approved by Congress for other purposes, notably the Pentagon budget for military construction projects.